“Holy cow, this place is big.” I walked into the massive, new Tuscan Table at the Maine Mall (in its own building), amazed by its gargantuan size. With decorative lighting, a huge oval bar that encompassed much of the first floor, and a sizable upper level, it felt a little like walking into a casino or resort grand entrance. Wy wife – we drove there separately – texted me the directions “left upon entering and up the stairs.” I followed them and found her. She had already ordered a drink when I sat, so I looked at the list of libations, hoping to try something new. The cocktails didn’t excite me, but I was pleased to find a beer from a local brewery I had yet to try, which rarely happens these days. I went with The Thirsty Botanist IPA from Boothbay Craft Brewery. The waitress said that was her favorite – don’t they all say that? My wife had ordered a rose; it’s her new thing. The food menu consisted of a wide selection of mostly typical Italian restaurant fare with a hint of Maine flair. It started with raw and chilled seafood while meats, cheese, and antipasti followed. On the reverse were salads, pasta, pizza, and entrees. I was impressed with the selection. Each section had plenty of options and many appeared quite interesting and, I assumed, delicious. Because I was having some difficulty picking an app, I went with what I considered a sure thing, deciding to order one meat ($3 each; seven options) and one cheese ($5 each; seven options). After a couple questions about ones with which I wasn’t familiar, I went with Prosciutto di Parma and Foglie di Noce. 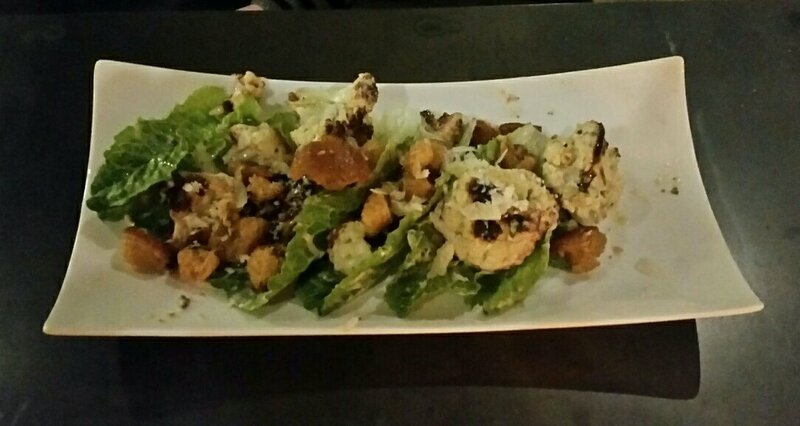 My wife ordered Cavolfiore – roasted cauliflower, romaine lettuce, anchovy lemon dressing, garlic croutons, grana padano. 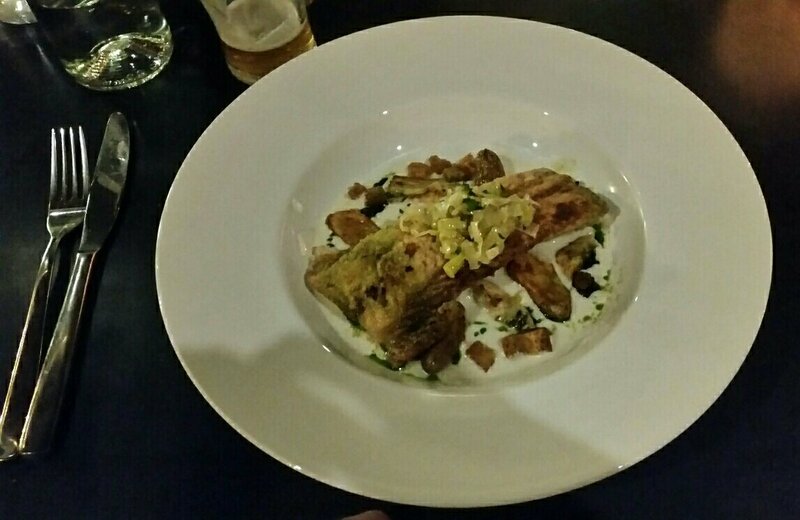 For entrees, I decided on the Maine Haddock – oven roasted leek, Maine potato, artichoke, basil and shallot sauce, garlic croutons. Even though I’m not a huge fan of artichokes, I figured they probably weren’t a major player in the dish, though I didn’t bother asking. 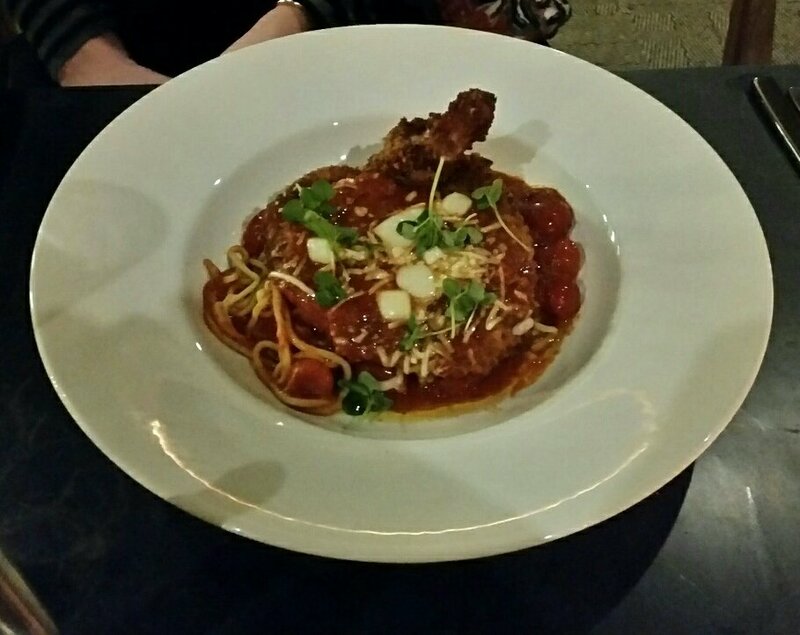 She chose the Chicken Parmigiano – crispy chicken marinated in basil buttermilk, cherry tomato sauce, fresh mozzarella, spaghetti pomodoro. My beer turned out to be a winner. A really excellent brew with plenty of hop and a fairly prevalent boquet of citrus, I highly recommend it. Our apps came quickly which was good; service had been a bit on the slow side until that point. Mine looked awesome and had a particularly large serving of cheese which was great because I occassionally feel somewhat shortchanged on cheese plates. Upon inspection, I was a little perplexed by what I had in front of me. 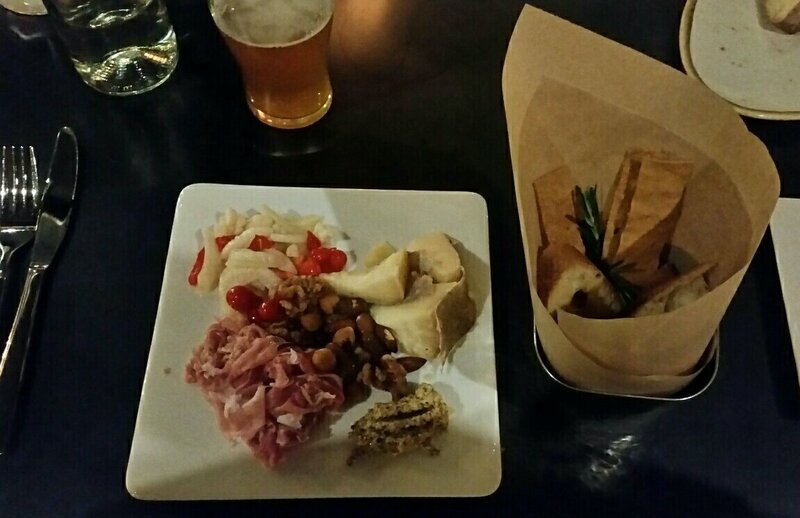 The meats and cheeses both came with crackers and crostini provided in a separate pail. However, the meat was supposed to be accompanied by giardiniera, house mustard, walnut grape jam, and the cheese with sultana mostarda, Maine honey, spiced nuts. I was missing walnut grape jam, sultant mostarda, and honey. I’m not sure it mattered much, but it was confusing since the menu indicated that’s what I was getting. Despite my missing pieces, I forged ahead, not particularly concerned with what I didn’t have. The main parts were both excellent – the foglie de noce reminded me of manchego – and the house mustard was truly superb. It went perfectly on my little crostini sandwich and I couldn’t get enough except that it had a moderate heat which prevented it from being eaten in massive portions. The nuts and giardiniera were also both delicious. As I ate my starter, I ran into two issues. One was that the house made crackers were long, slender, and somewhat brittle. They weren’t made to have toppings piled on. Other than a dip in the mustard, they couldn’t handle anything else added to them. A shorter, wider cracker would have been more conducive to my plight. Because of that, I ran out of crostini and crackers too soon and was left to pile the rest on top of the bread service we had remaining. After I finished my food, I tried a bite of her cauliflower salad. It was fine, but I prefer my roasted veggies warm and was happy with what I ordered. She eradicated the rest of the veggies and we soon were in receipt of the entrees. Hers looked slightly larger than mine, though I surmised that after our apps, we would both have enough for us to leave without going hungry. We started to dig in. On the bottom of my dish was the cream sauce, in which my fish swam. The artichoke, taters, and croutons were also paddling in it. I took a bite of the haddock. It was on the well done side which was totally fine with me, but I think others might have wanted it pulled from the oven a minute or two sooner. The cream sauce was tasty, though a tad weak. I pushed the few artichoke pieces aside, but enjoyed the potatoes and crunchy croutons and thought they added nicely to the plate. Many bites into my food, I was sold on the haddock plate as quite good, though lacking the umph to be great. I did finish it and tried my wife’s chicken when I was done. I hadn’t noticed that it was on the bone which surprised me. Still, my two bites were very pleasant. It was definitely crispy – as the menu had promised – and nicely seasoned. Though I didn’t have enough to confirm, I might have liked that more than my own meal. She couldn’t finish all her food and neither of us were able to eat dessert. We called it quits and left, our meal coming to just over $90 with tax and tip. 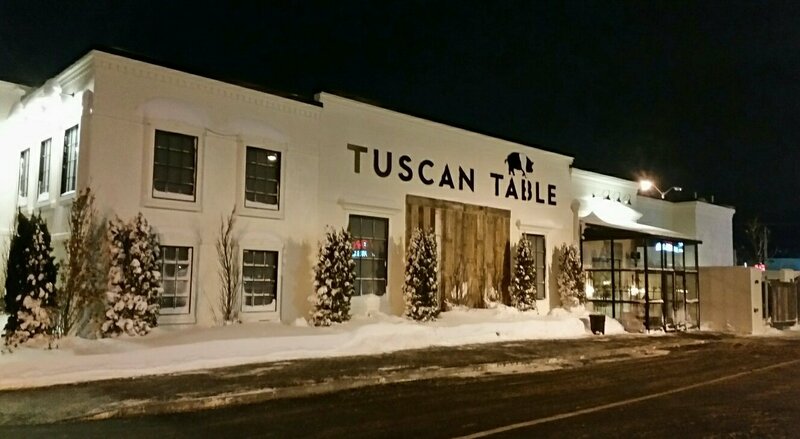 Tuscan Table adds a solid option to dining near the mall. They have a few items they can work on, but they are minor. Our service started off a little on the slow side, and then picked up to the point that the waitress came by a bunch of times to make sure we were all set. Ideally, that could be smoothed out some. In addition to the service, the meat and cheese plate – which I felt was both really delicious and a very fair value -needs a couple of – I’ll call them logistical – improvements. And my haddock was good, but not the great, flavorful piece of art I’d look for in a perfect world. Still, Tuscan Table is off to a good start in their first weeks. In fact, good enough that my wife went back with a friend the very next night. I think it’s reasonable that you check it out at least once and see what you think. 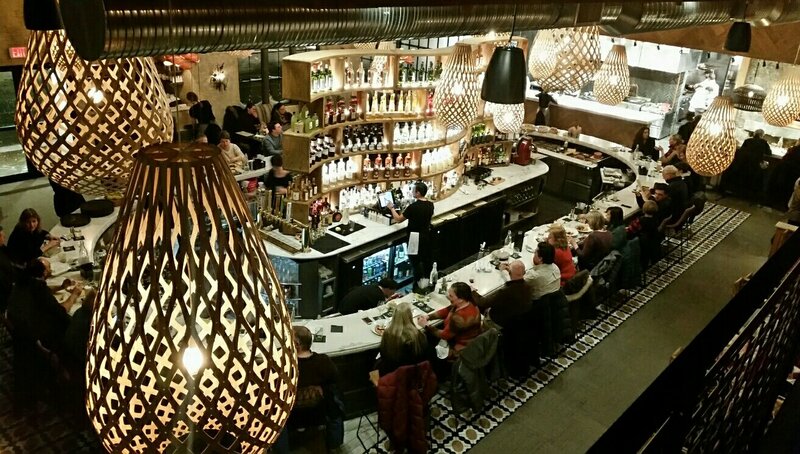 This entry was posted in Portland, ME food and tagged blog, food, peterpeterportlandeater, pppe on January 13, 2018 by peterpeterportlandeater.